What’s the right size skip bin for me? Choosing the right skip bin isn’t the easiest decision to make. If you choose something too large you’re wasting money, but if you choose something too small you’ll find yourself needing to order a second skip bin. This not only wastes money but time too, as you will need to fill the first skip bin and get it picked up before the second one arrives (if you’re dealing with space constraints). When choosing the right sized skip bin you need to take into consideration what sort of items you’re going to dispose of. Start by creating a list of what will need to go into the skip bin – write down the biggest first, and then work your way through to the smallest, plus take into account the quantity of each. This process will help you get a clear idea of what you’re throwing out and consequently a better understanding of how much space you will need. Tip to make the most of your skip bin space! Pack properly. Good packing helps to eliminate excess ‘air’ holes and spaces between the items you’re disposing of. Cut down large pieces and break down what’s possible such as old furniture. Reducing the overall size of each item and ensuring it is flat packed as much as possible will help you make the most of your skip bin. If you’re after a skip bin, or have any queries, get in touch with Skips 365 today! We service households and commercial sites Sydney-wide. 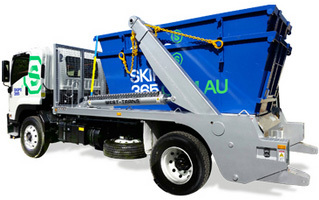 Simply call 1300 763 362 or email us at enquiries@skips365.com.au and one of our friendly team will help you out. Skips 365 services the following Sydney regions: CBD, Inner West, Eastern Suburbs, Northern Suburbs, South Sydney and Greater Western Sydney. We work hard to keep our customers happy.